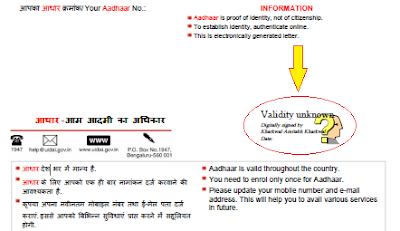 MukulPost: How to Validate Digital Signatures on e-Aadhaar? After downloading your E-aadhaar letter online you may have noticed that, in place of digital signatures it shows Validity Unknown. It is because that you haven't added the signatory to your trusted certificates. 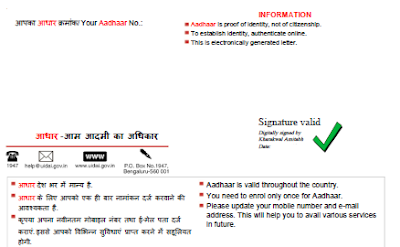 If you see the Validity Unknown icon on your e-Aadhaar, please follow the below steps to Validate it. 1. Right click on the Validity Unknown icon and click on Validate Signature. 4. Verify that there is a certification path named NIC CA 2011. This identifies NIC CA as the owner of the digital certificate that has been used when signing the document. 6. Now a window will open called Acrobat Security click on OK.
7. Check (√) the field for Use this Certificate as a Trusted Root and click OK to close window. 8. Click Validate Signature to start the validation process. (1). The above tutorial is based on assumption that you are using Adobe Reader XI. (2). Make sure that your Computer is connected to internet while validating digital signature.